The luxury vehicles that qualify for the Acura CPO program have been thoroughly vetted and come backed by extensive warranties, all for your peace of mind – and to save you a few dollars while at it. Apply for financing online to expedite the process when you visit our dealership and work with our team to find your ideal CPO Acura, whether that’s a certified RDX or certified MDX. New Price! Odometer is 960 miles below market average! *Bluetooth*, *Backup Camera*, ABS brakes, Alloy wheels, Electronic Stability Control, Heated Front Sport Seats, Illuminated entry, Power moonroof, Remote keyless entry, Traction control. 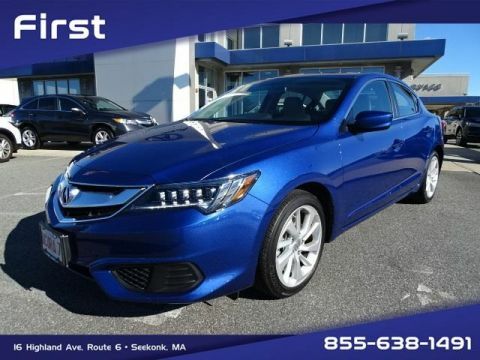 35/25 Highway/City MPG** Catalina Blue Pearl 2017 Acura ILX 2.4L with Graystone Interior. Certification Program Details: 6 Years/100,000 Miles First Acura offers you a great deal for a highly cared for, lightly driven Acura. These vehicles have been meticulously maintained by our service facility. So, if you ever wanted a great deal on a current model year Acura, NOW is the time! Priced below KBB Fair Purchase Price! CARFAX One-Owner. Exterior Parking Camera Rear, Power moonroof. 24/35 City/Highway MPG Crystal Black Pearl 2016 Acura TLX 2.4L Acura Certified Pre-Owned Details: * 182 Point Inspection * Roadside Assistance * Warranty Deductible: $0 * Powertrain Limited Warranty: 84 Month/100,000 Mile (whichever comes first) from original in-service date * Transferable Warranty * Includes Trip Interruption and Concierge Services * Vehicle History * Limited Warranty: 12 Month/12,000 Mile (whichever comes first) after new car warranty expires or from certified purchase date While having your Acura serviced at First Acura, please enjoy the amenities of our Customer Waiting Lounge. We offer a clean and comfortable waiting area with free Wi-Fi and multiple work stations. Complimentary local shuttle service is also available. CARFAX One-Owner. Navigation System, Power moonroof, Radio: Acura/ELS Studio Premium Audio System. 24/35 City/Highway MPG Bellanova White Pearl 2016 Acura TLX 2.4L Acura Certified Pre-Owned Details: * Roadside Assistance * Transferable Warranty * Vehicle History * Powertrain Limited Warranty: 84 Month/100,000 Mile (whichever comes first) from original in-service date * Limited Warranty: 12 Month/12,000 Mile (whichever comes first) after new car warranty expires or from certified purchase date * Includes Trip Interruption and Concierge Services * 182 Point Inspection * Warranty Deductible: $0 While having your Acura serviced at First Acura, please enjoy the amenities of our Customer Waiting Lounge. We offer a clean and comfortable waiting area with free Wi-Fi and multiple work stations. Complimentary local shuttle service is also available. CARFAX One-Owner. Navigation System, Radio: Acura/ELS Studio Premium Audio System. 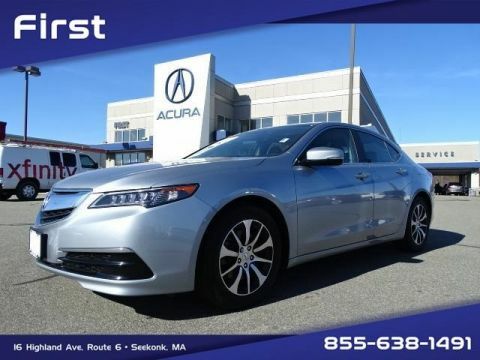 24/35 City/Highway MPG Slate Silver Metallic 2016 Acura TLX 2.4L Acura Certified Pre-Owned Details: * Vehicle History * Powertrain Limited Warranty: 84 Month/100,000 Mile (whichever comes first) from original in-service date * Includes Trip Interruption and Concierge Services * Limited Warranty: 12 Month/12,000 Mile (whichever comes first) after new car warranty expires or from certified purchase date * 182 Point Inspection * Warranty Deductible: $0 * Transferable Warranty * Roadside Assistance While having your Acura serviced at First Acura, please enjoy the amenities of our Customer Waiting Lounge. We offer a clean and comfortable waiting area with free Wi-Fi and multiple work stations. Complimentary local shuttle service is also available. Odometer is 13756 miles below market average! CARFAX One-Owner. Navigation System, Premium audio system: Acura/ELS Surround. 21/34 City/Highway MPG Graphite Luster Metallic 2016 Acura TLX 3.5L V6 Acura Certified Pre-Owned Details: * 182 Point Inspection * Powertrain Limited Warranty: 84 Month/100,000 Mile (whichever comes first) from original in-service date * Roadside Assistance * Limited Warranty: 12 Month/12,000 Mile (whichever comes first) after new car warranty expires or from certified purchase date * Includes Trip Interruption and Concierge Services * Warranty Deductible: $0 * Transferable Warranty * Vehicle History While having your Acura serviced at First Acura, please enjoy the amenities of our Customer Waiting Lounge. We offer a clean and comfortable waiting area with free Wi-Fi and multiple work stations. Complimentary local shuttle service is also available. CARFAX One-Owner. Exterior Parking Camera Rear, Power Liftgate, Power moonroof. 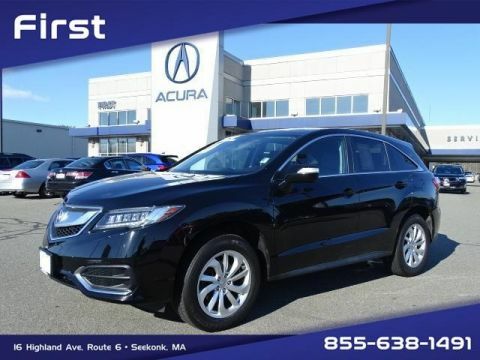 19/28 City/Highway MPG Crystal Black Pearl 2016 Acura RDX Acura Certified Pre-Owned Details: * Limited Warranty: 12 Month/12,000 Mile (whichever comes first) after new car warranty expires or from certified purchase date * Roadside Assistance * Warranty Deductible: $0 * Vehicle History * Transferable Warranty * Includes Trip Interruption and Concierge Services * Powertrain Limited Warranty: 84 Month/100,000 Mile (whichever comes first) from original in-service date * 182 Point Inspection While having your Acura serviced at First Acura, please enjoy the amenities of our Customer Waiting Lounge. We offer a clean and comfortable waiting area with free Wi-Fi and multiple work stations. Complimentary local shuttle service is also available. Odometer is 10895 miles below market average! CARFAX One-Owner. 19/28 City/Highway MPG Slate Silver Metallic 2016 Acura RDX Acura Certified Pre-Owned Details: * 182 Point Inspection * Transferable Warranty * Includes Trip Interruption and Concierge Services * Roadside Assistance * Vehicle History * Limited Warranty: 12 Month/12,000 Mile (whichever comes first) after new car warranty expires or from certified purchase date * Warranty Deductible: $0 * Powertrain Limited Warranty: 84 Month/100,000 Mile (whichever comes first) from original in-service date While having your Acura serviced at First Acura, please enjoy the amenities of our Customer Waiting Lounge. We offer a clean and comfortable waiting area with free Wi-Fi and multiple work stations. Complimentary local shuttle service is also available. CARFAX One-Owner. Blind spot sensor: warning, Navigation System, Power Liftgate, Power moonroof. 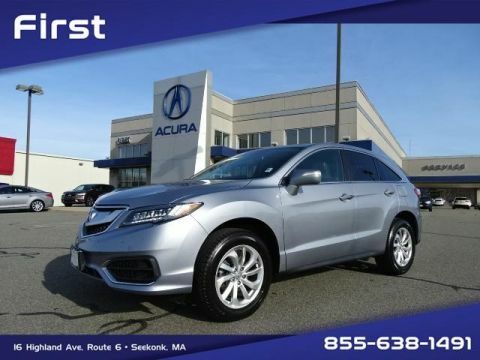 19/28 City/Highway MPG Slate Silver Metallic 2016 Acura RDX Acura Certified Pre-Owned Details: * Limited Warranty: 12 Month/12,000 Mile (whichever comes first) after new car warranty expires or from certified purchase date * Includes Trip Interruption and Concierge Services * Warranty Deductible: $0 * Vehicle History * 182 Point Inspection * Powertrain Limited Warranty: 84 Month/100,000 Mile (whichever comes first) from original in-service date * Transferable Warranty * Roadside Assistance While having your Acura serviced at First Acura, please enjoy the amenities of our Customer Waiting Lounge. We offer a clean and comfortable waiting area with free Wi-Fi and multiple work stations. Complimentary local shuttle service is also available. Odometer is 7401 miles below market average! CARFAX One-Owner. Exterior Parking Camera Rear, Power Liftgate, Power moonroof. 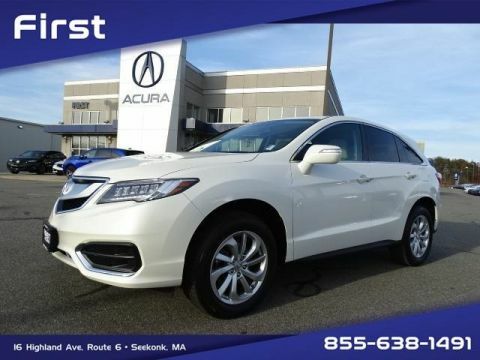 19/28 City/Highway MPG White Diamond Pearl 2016 Acura RDX Acura Certified Pre-Owned Details: * Includes Trip Interruption and Concierge Services * Vehicle History * Transferable Warranty * Warranty Deductible: $0 * 182 Point Inspection * Limited Warranty: 12 Month/12,000 Mile (whichever comes first) after new car warranty expires or from certified purchase date * Roadside Assistance * Powertrain Limited Warranty: 84 Month/100,000 Mile (whichever comes first) from original in-service date While having your Acura serviced at First Acura, please enjoy the amenities of our Customer Waiting Lounge. We offer a clean and comfortable waiting area with free Wi-Fi and multiple work stations. Complimentary local shuttle service is also available. Priced below KBB Fair Purchase Price! CARFAX One-Owner. Excellent Service History!. 18/26 City/Highway MPG Crystal Black Pearl 2016 Acura MDX 3.5L Acura Certified Pre-Owned Details: * Warranty Deductible: $0 * 182 Point Inspection * Limited Warranty: 12 Month/12,000 Mile (whichever comes first) after new car warranty expires or from certified purchase date * Includes Trip Interruption and Concierge Services * Vehicle History * Roadside Assistance * Transferable Warranty * Powertrain Limited Warranty: 84 Month/100,000 Mile (whichever comes first) from original in-service date While having your Acura serviced at First Acura, please enjoy the amenities of our Customer Waiting Lounge. We offer a clean and comfortable waiting area with free Wi-Fi and multiple work stations. Complimentary local shuttle service is also available. Odometer is 5050 miles below market average! CARFAX One-Owner. Blind Spot Information System, GPS-Linked Climate Control, Navigation System, Power Liftgate, Power moonroof, Radio: Acura/ELS Studio Premium Audio System. 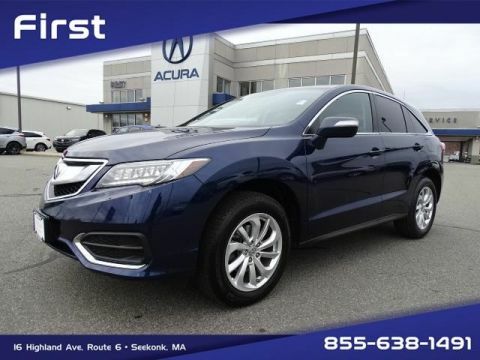 19/28 City/Highway MPG Fathom Blue Pearl 2016 Acura RDX Acura Certified Pre-Owned Details: * Vehicle History * Limited Warranty: 12 Month/12,000 Mile (whichever comes first) after new car warranty expires or from certified purchase date * Transferable Warranty * Roadside Assistance * Includes Trip Interruption and Concierge Services * Warranty Deductible: $0 * 182 Point Inspection * Powertrain Limited Warranty: 84 Month/100,000 Mile (whichever comes first) from original in-service date While having your Acura serviced at First Acura, please enjoy the amenities of our Customer Waiting Lounge. We offer a clean and comfortable waiting area with free Wi-Fi and multiple work stations. Complimentary local shuttle service is also available. Acura Navigation System w/3D View, Blind Spot Information (BSI) System, Radio: Acura/ELS Studio Premium Audio System. 18/26 City/Highway MPG Crystal Black Pearl 2016 Acura MDX 3.5L Acura Certified Pre-Owned Details: * Warranty Deductible: $0 * Transferable Warranty * 182 Point Inspection * Roadside Assistance * Limited Warranty: 12 Month/12,000 Mile (whichever comes first) after new car warranty expires or from certified purchase date * Vehicle History * Powertrain Limited Warranty: 84 Month/100,000 Mile (whichever comes first) from original in-service date * Includes Trip Interruption and Concierge Services Drivers near Providence need to look no farther than First Acura, to satisfy all their luxury automotive needs. 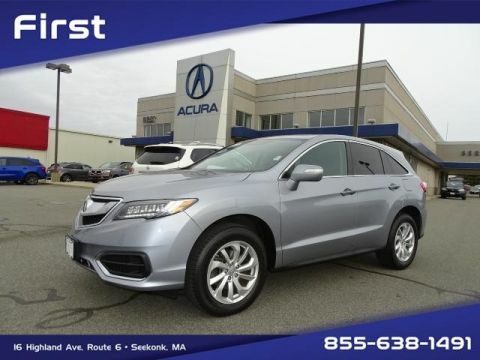 Browse our online inventory, or visit our showroom for affordable new Acura cars, used vehicles, and certified pre-owned Acuras, such as the Acura TLX, ILX, MDX, and many more. We make service quick and easy with our Acura Accelerated Service. Our Acura-trained and certified ASE technicians have the knowledge and experience to provide you with the best service. Acura DVD Rear Entertainment System, Blind spot sensor: warning, Brake assist, GPS-Linked Climate Control, Headphones, Navigation System, Power Liftgate, Radio: Acura/ELS Studio Premium Audio System. 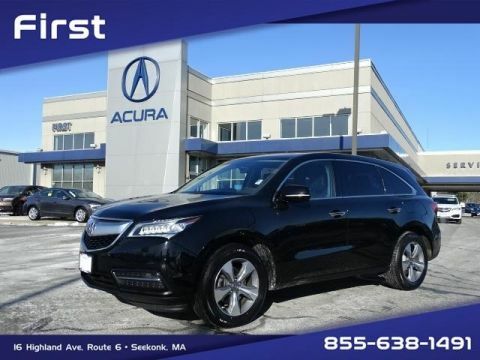 18/26 City/Highway MPG Crystal Black Pearl 2016 Acura MDX 3.5L Acura Certified Pre-Owned Details: * Powertrain Limited Warranty: 84 Month/100,000 Mile (whichever comes first) from original in-service date * Transferable Warranty * Warranty Deductible: $0 * 182 Point Inspection * Includes Trip Interruption and Concierge Services * Roadside Assistance * Limited Warranty: 12 Month/12,000 Mile (whichever comes first) after new car warranty expires or from certified purchase date * Vehicle History Serving the Seekonk area, First Acura, is your premier retailer of new and used Acura vehicles. Our dedicated sales staff and factory-trained technicians are here to make your auto shopping experience fun, easy and financially advantageous. Please utilize our various online resources and allow our excellent network of people to put you in your ideal car, truck or SUV today! Odometer is 9520 miles below market average! CARFAX One-Owner. 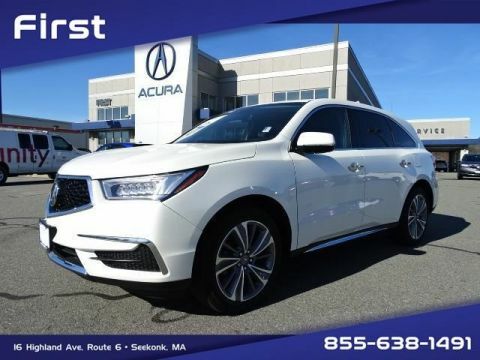 18/26 City/Highway MPG White Diamond Pearl 2017 Acura MDX 3.5L Acura Certified Pre-Owned Details: * Limited Warranty: 12 Month/12,000 Mile (whichever comes first) after new car warranty expires or from certified purchase date * Vehicle History * Warranty Deductible: $0 * Includes Trip Interruption and Concierge Services * Transferable Warranty * Powertrain Limited Warranty: 84 Month/100,000 Mile (whichever comes first) from original in-service date * Roadside Assistance * 182 Point Inspection While having your Acura serviced at First Acura, please enjoy the amenities of our Customer Waiting Lounge. We offer a clean and comfortable waiting area with free Wi-Fi and multiple work stations. Complimentary local shuttle service is also available. Opting for a certified pre-owned Acura means you’re in for even more benefits than simply owning a luxury vehicle. For one, you’ll receive a complimentary membership to Acura Owners, an online resource for service reminders, special offers, and more. You’ll also get roadside assistance for the first 12 months or 12,000 miles, whichever comes first, during which time your certified pre-owned Acura vehicle is covered by a limited warranty. For even greater coverage, you can tack on Acura Care, which involves service contracts backing certain components of your car. 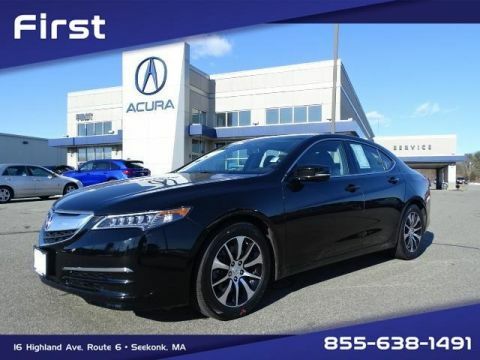 In any case, you can rest assured that your certified pre-owned Acura will serve you well around Providence for years to come. You can also compare the Acura Certified Pre-Owned Program vs. the Audi Certified Pre-Owned Program, Lexus Certified Pre-Owned Program, and the INFINITI Certified Pre-Owned Program to learn about the competition!